Do you have a case of the creepy crawlies? Maybe they have overtaken your Minneapolis, MN front yard or maybe your kitchen has attracted some unwanted attention. Whether it’s your location or your extraordinary culinary skills – EcoTech can eliminate your problems. Our highly professional pest exterminators have the knowledge to not only rid your home of bugs but keep them out for good! We are so confident we offer a 4 year warranty on every extermination services we provide. You’ve definitely got a problem if multiple bugs invade the inside of your home. If you notice a bug on the windows, floors, countertops, cupboards and drawers, it’s time to get a professional pest exterminator to your home. Sometimes purchasing store bought bug killer doesn’t work or it’s just not an option, that’s when you’ll likely turn to a professionals help. The home is where the heart is, because you’ve got your family, pets, children, babies and parents all under one roof. Many of the traditional pest extermination products contain harmful chemicals, not safe to touch, ingest, and even breathe. Don’t think that just because you’ve got a baby at home you have to live with ants, beetles, too many spiders, fruit flies or any other insect – you don’t! 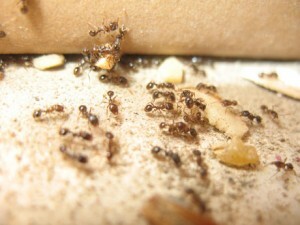 We offer a natural and organic pest control solution that is safe. Safe to touch, safe to smell and safe to ingest (though we don’t recommend it). And it works. Our organic spray kills immediately and is effective for most every buggy circumstance. We are a 5 time winner of the ANGIES LIST Super Service Award and have an “A” rating. We’ll take care of what’s bugging you, without any added risk of harsh chemicals. Call Ecotech today at 763-785-1414 or for emergency services call 763-232-7296 right now!